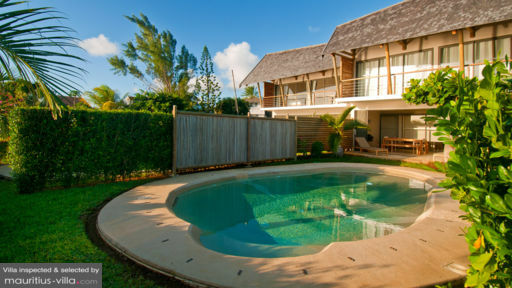 Nestled in the charming village of Kalodyne, in the north of Mauritius, Villa Baladirou is ideal for larger groups and families who wish to book a villa that’s close to the sea. Set in one of the most tranquil and scenic areas of the island, this particular villa also offers a variety of services and amenities designed to enhance your stay. At Villa Baladirou, you will find three bedrooms to very comfortably accommodate up to six people. The master bedroom boasts an ensuite bathroom, complete with private balcony access and panoramic views of the ocean. There’s also a safe for you to stow your valuables and important document during your holiday in Mauritius. The first guest bedroom also has a balcony access and boasts ocean views, while the second guest bedroom is fitted with two single beds. The guest bedrooms share a beautifully-appointed bathroom between them. All the bedrooms are equipped with a ceiling fan and air-conditioning. The villa is surrounded by a lush green garden with plenty of space for you to soak in the warm tropical sun. In the garden, you’ll also find an infinity pool which overlooks the Indian Ocean. In front of the pool, you’ll also find sun loungers where you can kick back and relax while enjoying a book or a movie on your tablet. There’s also plenty of space for fun barbecue evenings with your friends and families. Best of all, you’ll find ample space to enjoy Al Fresco dinners in the garden, or even a nice picnic lunch in the sun as you face the ocean. At Villa Baladirou, you’ll find that the open-plan living areas are designed to feel just like home. With exquisite coziness and an airy feel, the living room is fitted with a large coffee table and flat screen television with both local and international channels to keep you entertained during those lazy evenings in. Next to the living room is the spacious dining room which has plenty of space to spare for any extra guest you may wish to have over. This villa is self-catering, which means that you’ll have the opportunity to customize and prepare your own meals. As such, you can expect to enjoy a plethora of amenities and equipment designed to make it easy for you to whip up your favorite meal. These include- but are by no means limited to- the dishwasher, microwave, gas hob, oven, fridge as well as crockery and cutlery sets. 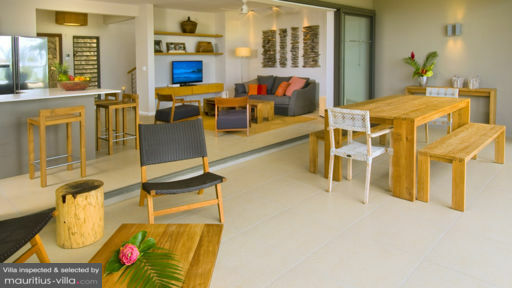 The veranda, kitchen, living area and lounge are all equipped with ceiling fans to protect you from the island heat. To ensure that you have a perfectly relaxing time at the villa, a housekeeper will show up every day- excluding public holidays and Sundays- from 9am to 1pm in order to take care of the cleaning. 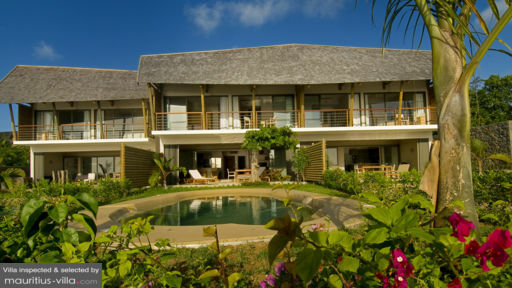 For an extra fee, she can also prepare an authentic Mauritian meal for you, right in the intimacy of your villa. A stay at Villa Baladirou places you literally next door to Yemaya Adventures, where you can book just about any kind of adventure from mountain biking to trekking or even sea kayaking. A diving agency is also close by to take you to some of the most picturesque diving spots in Mauritius, where you will be able to feast your eyes on plenty of coral, rare fish, sea turtles and various types of marine life.